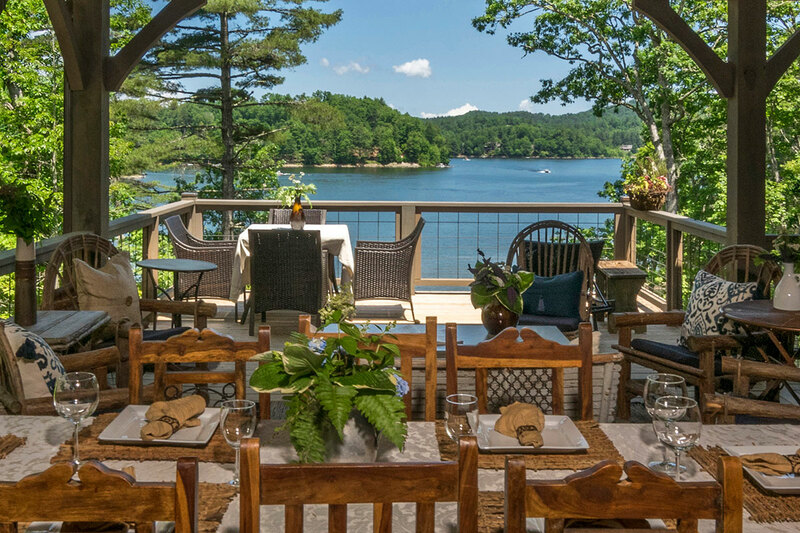 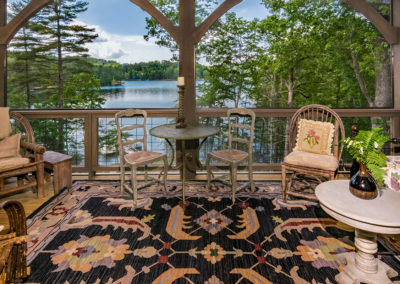 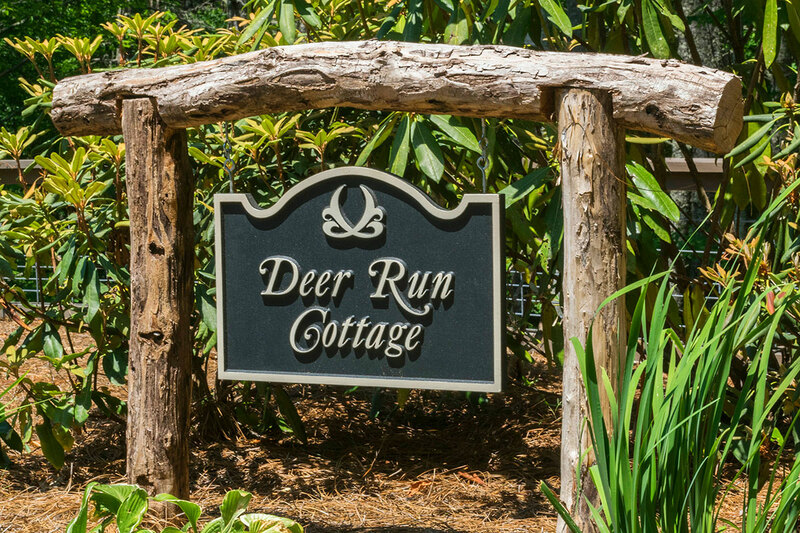 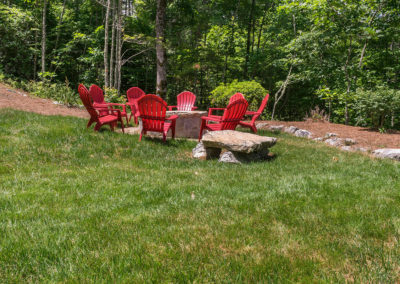 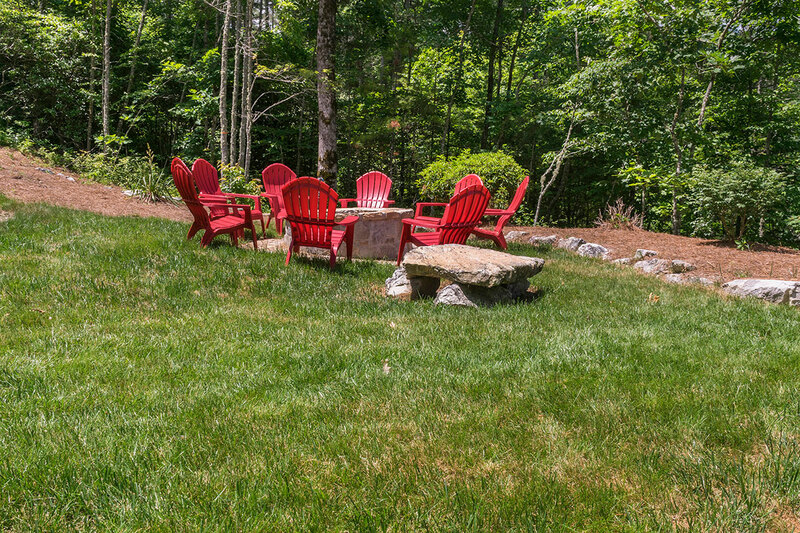 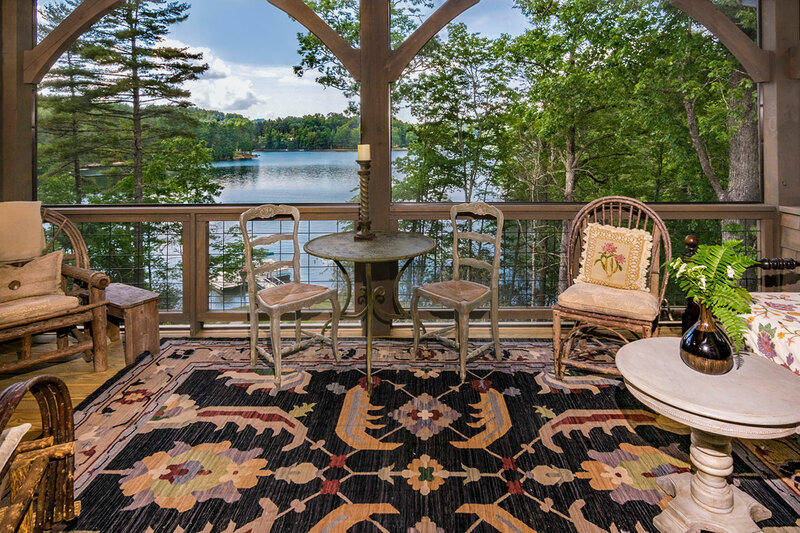 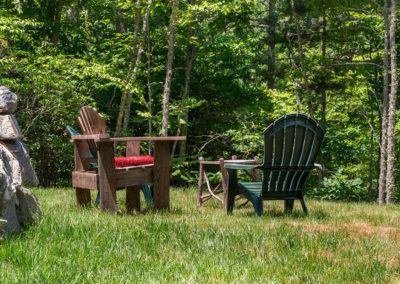 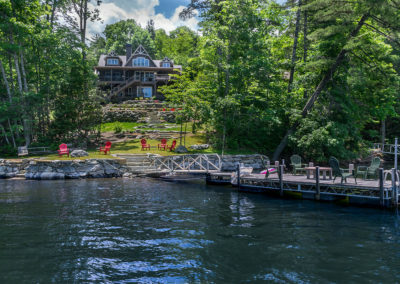 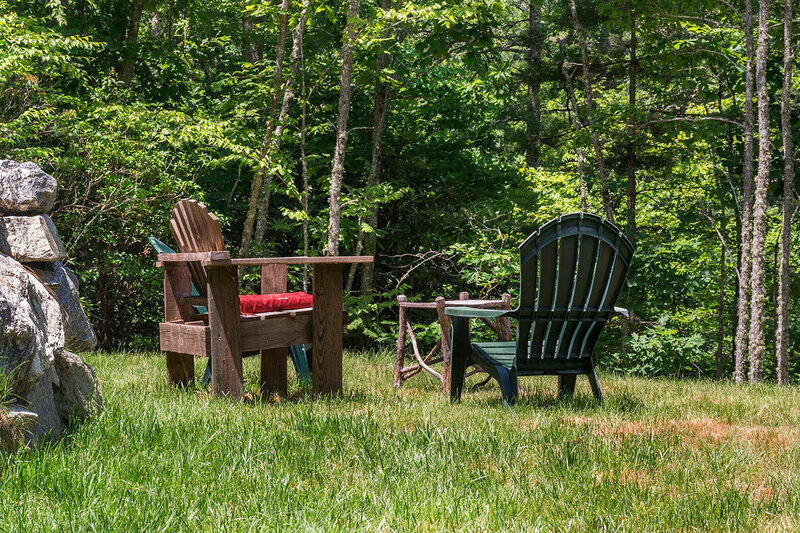 Deer Run Cottage commands quite a presence in a lovely wide and quiet cove. 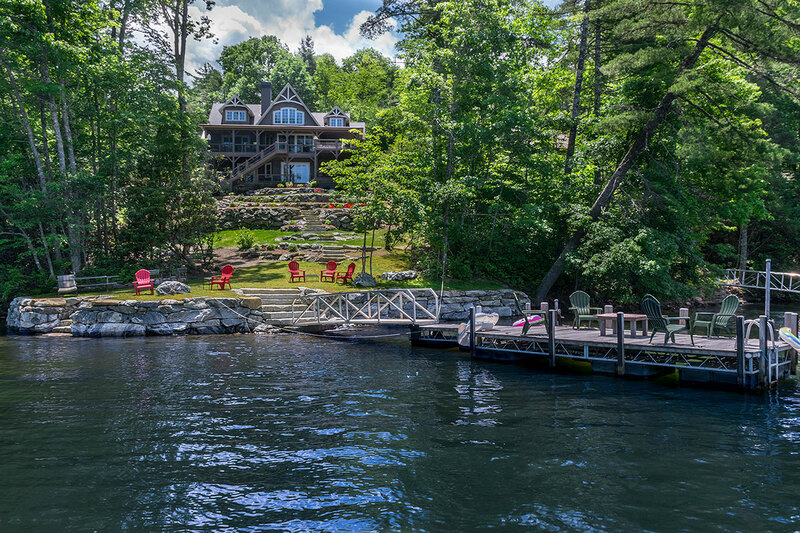 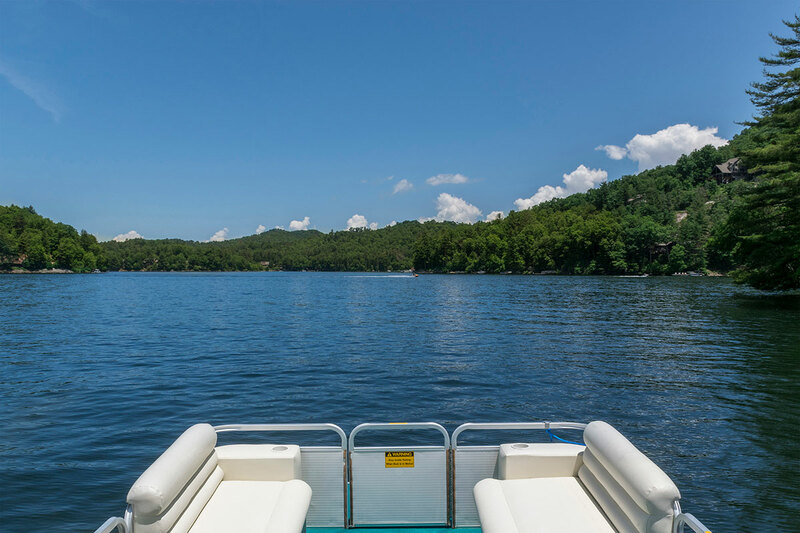 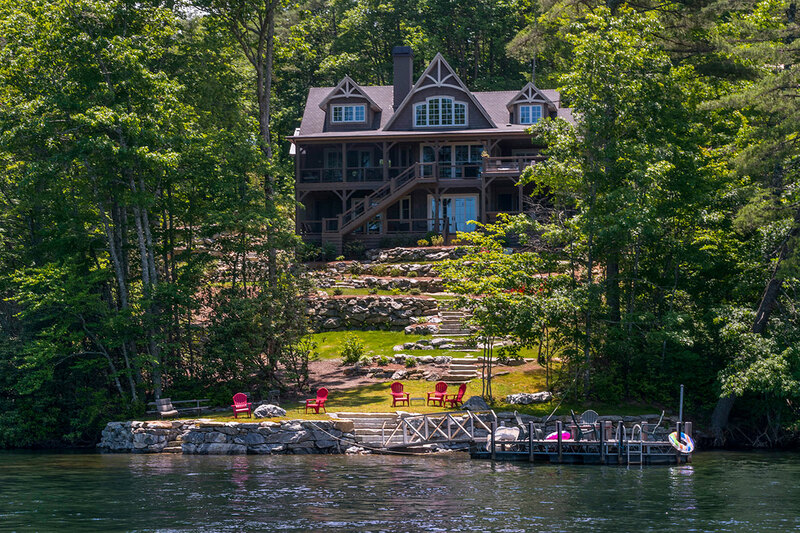 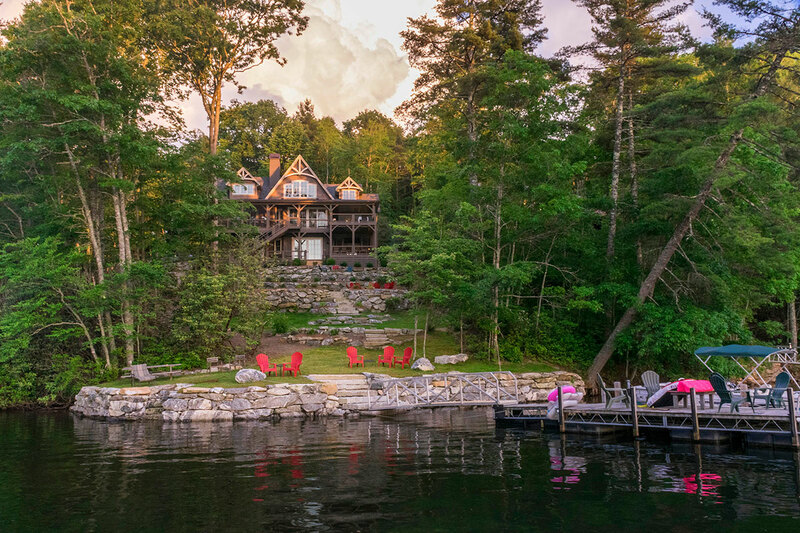 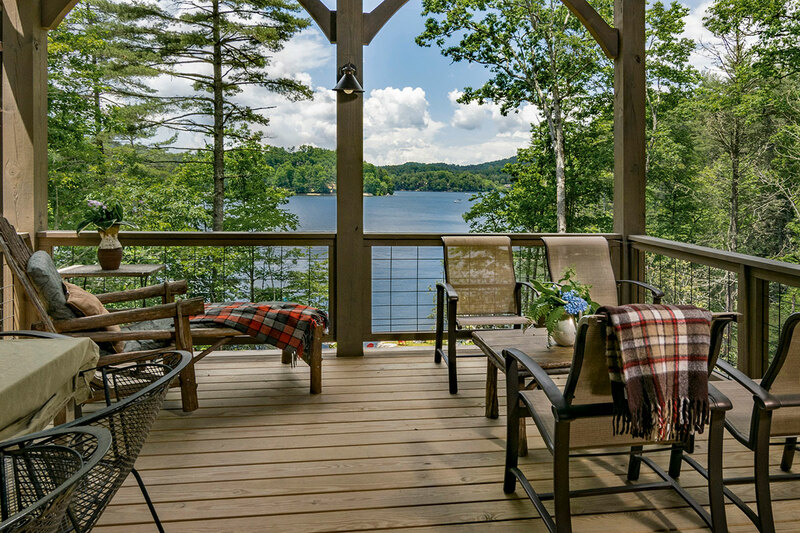 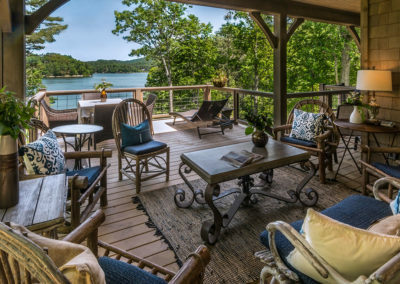 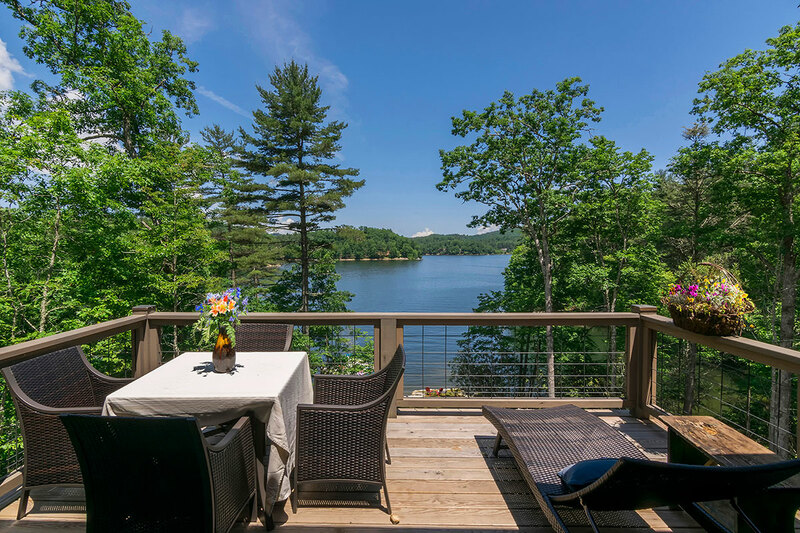 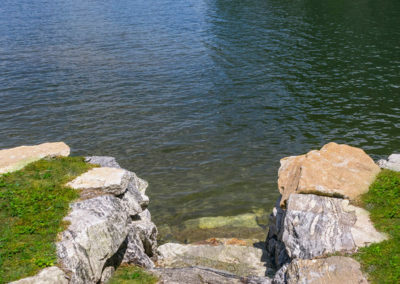 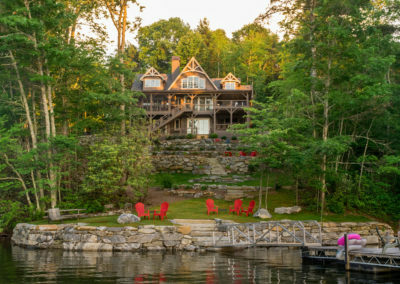 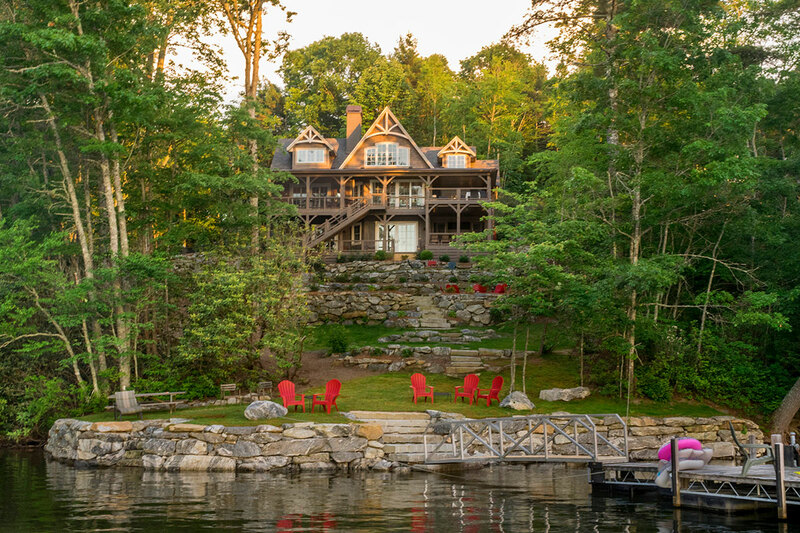 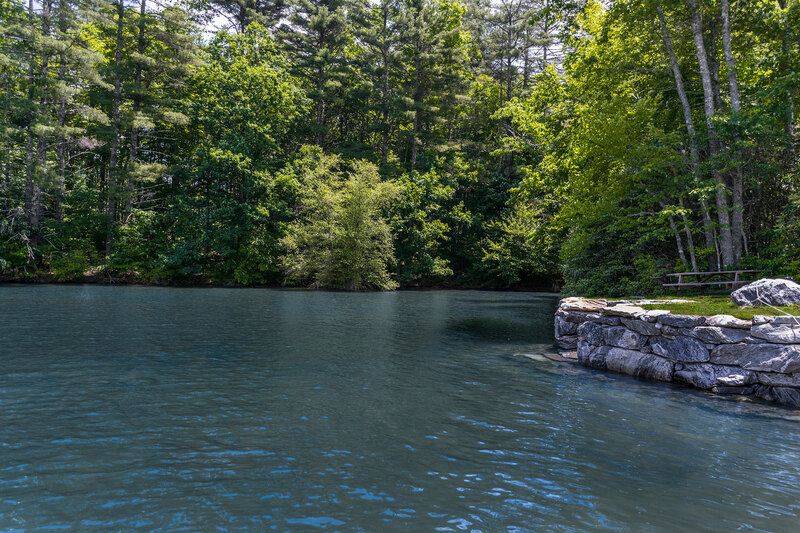 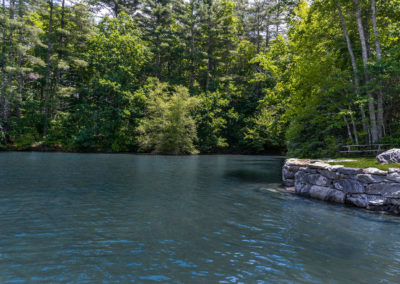 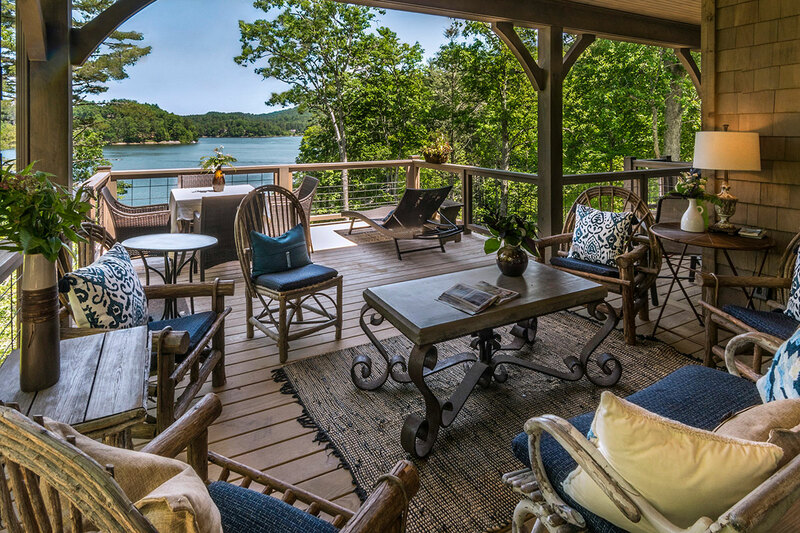 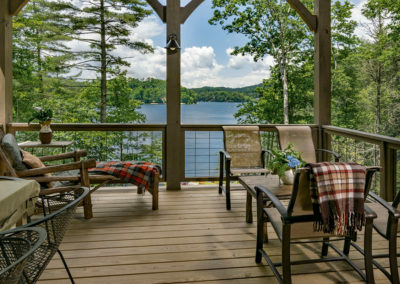 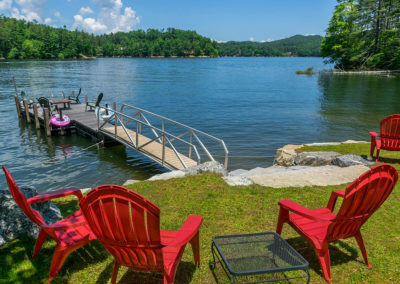 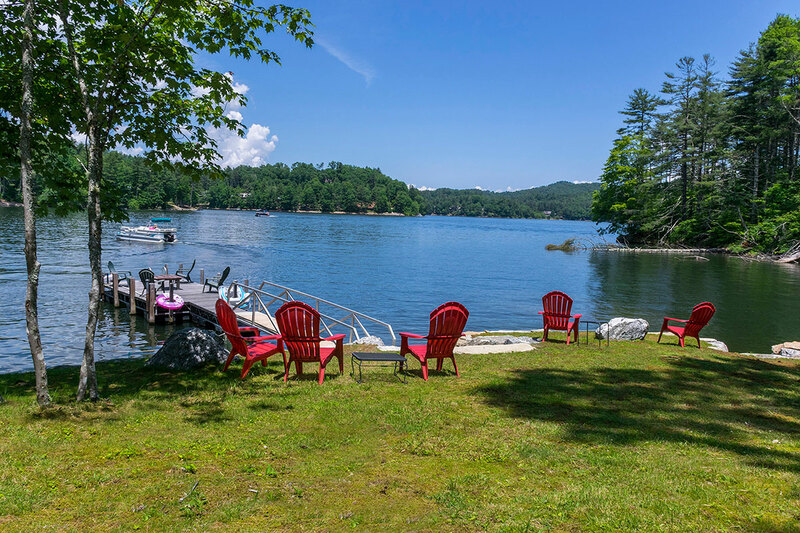 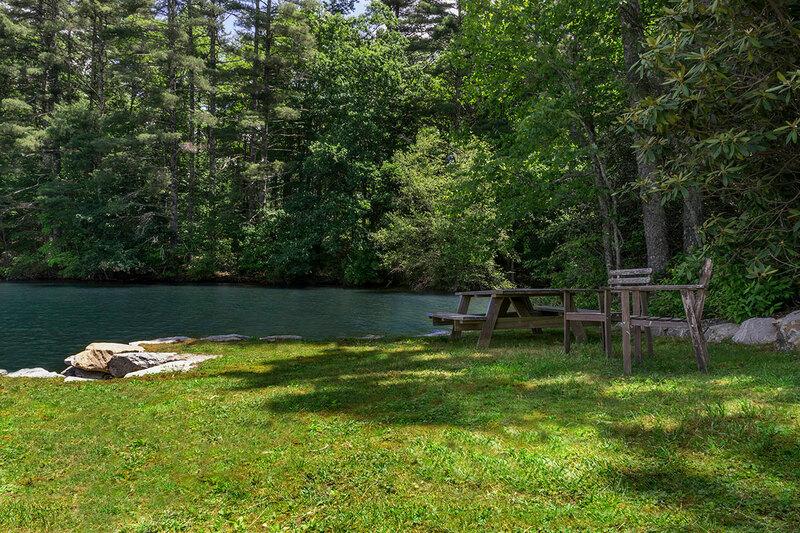 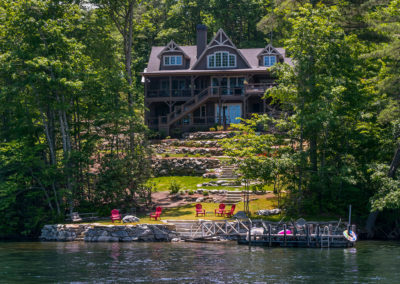 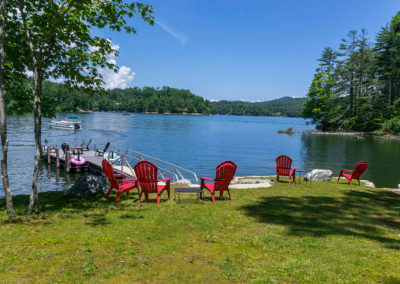 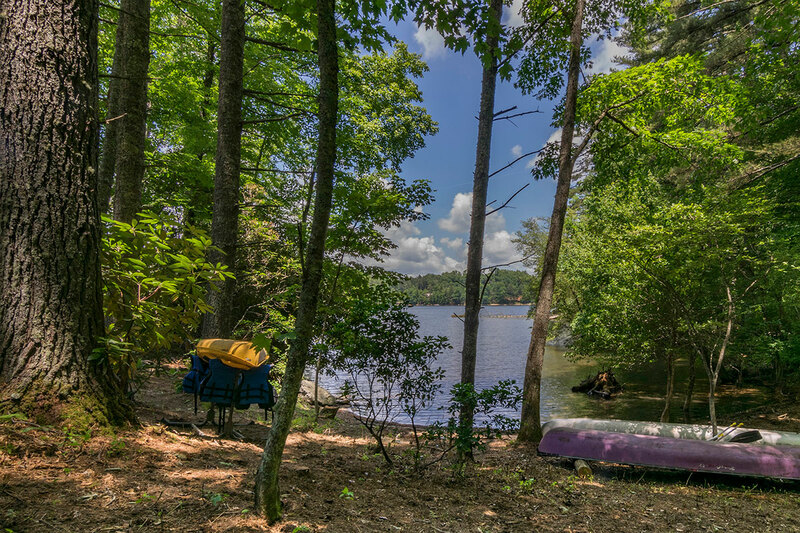 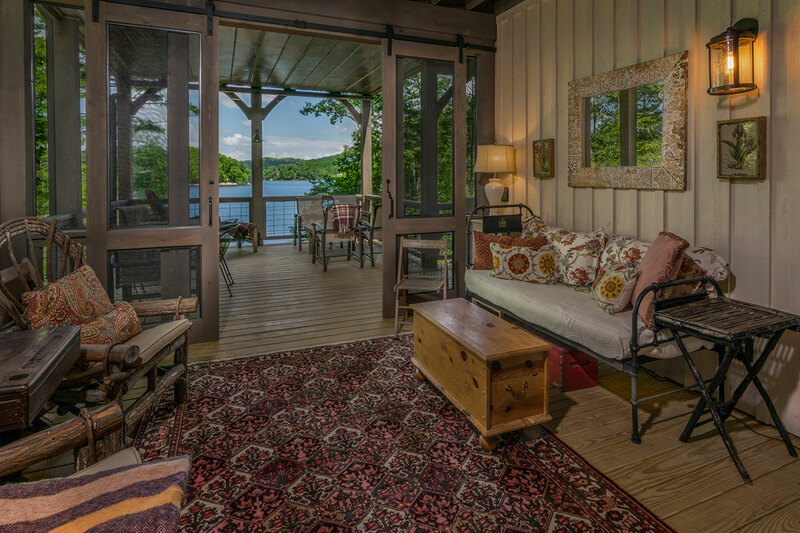 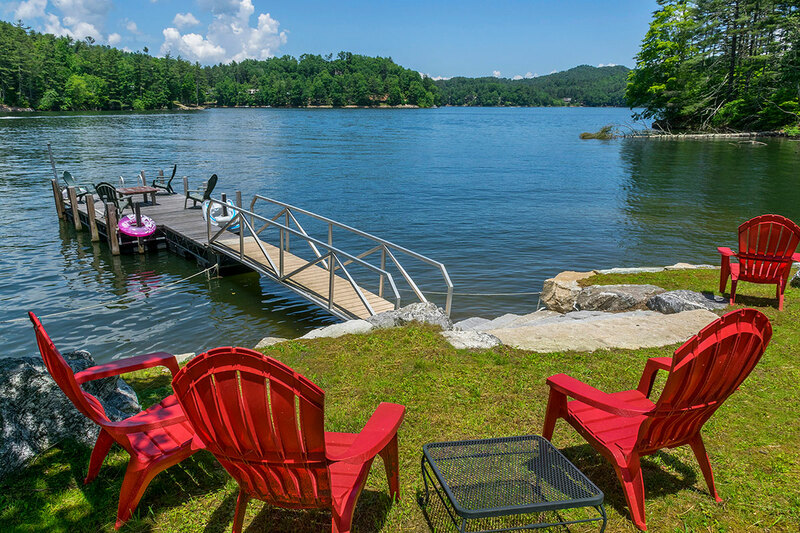 A private dock provides the perfect place for swimming, fishing and boating. 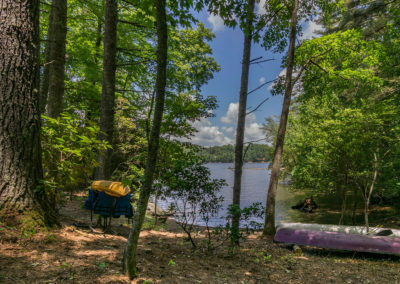 The sandy cove has kayaks and canoes for exploring the lake and its waterfalls. 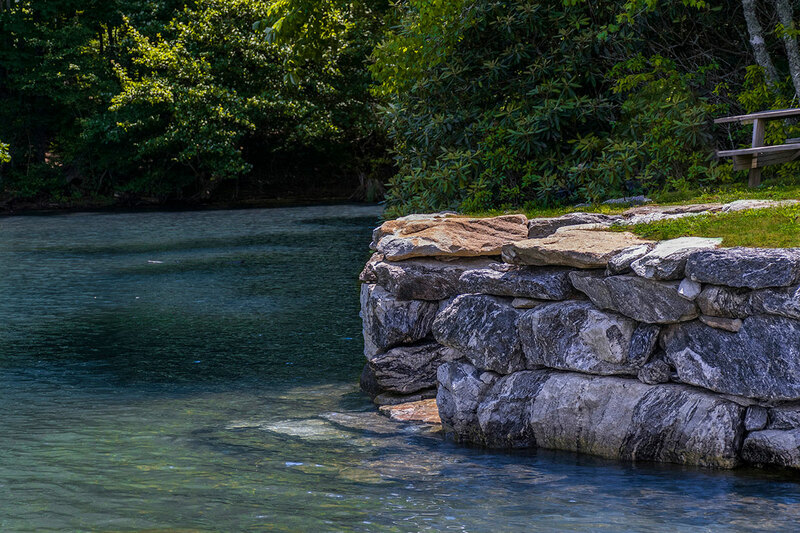 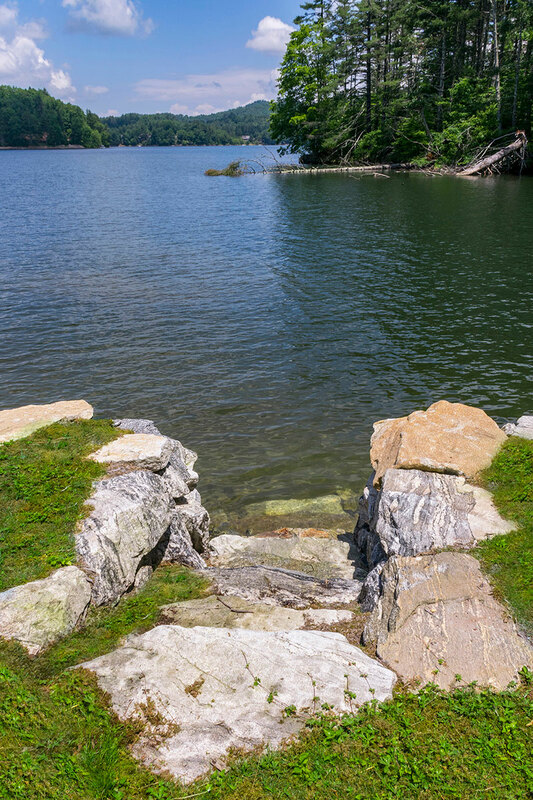 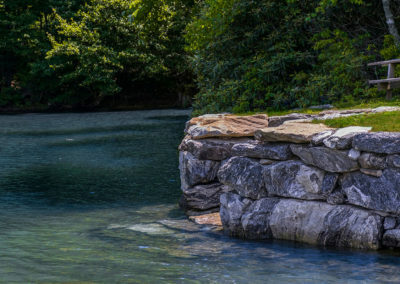 Stone stairs lead into a shallow area for wading and swimming. 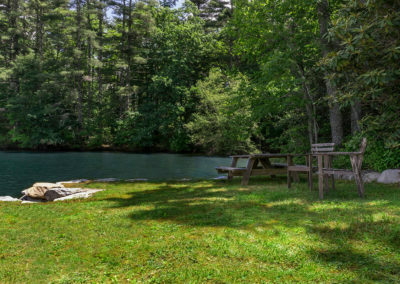 There is also a large fire pit for evening campfires. 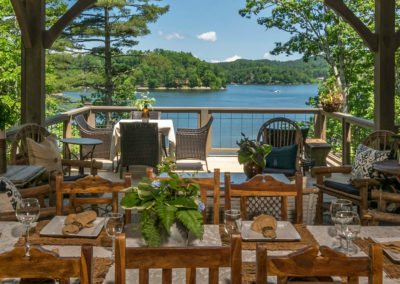 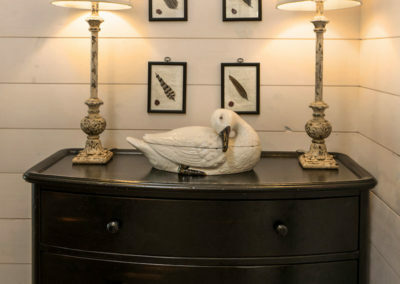 This property is definitely one-of-a-kind. 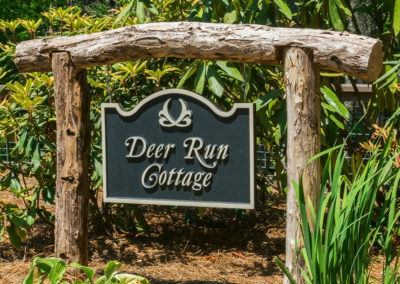 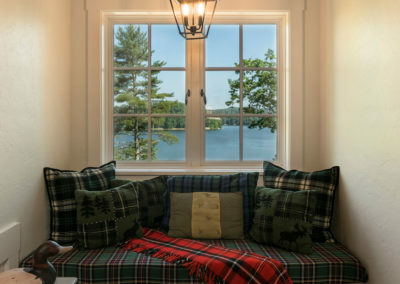 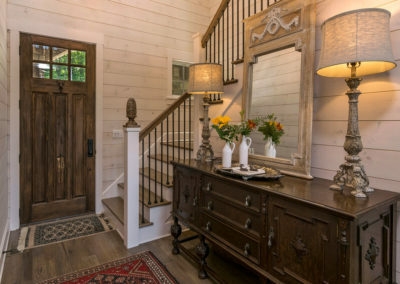 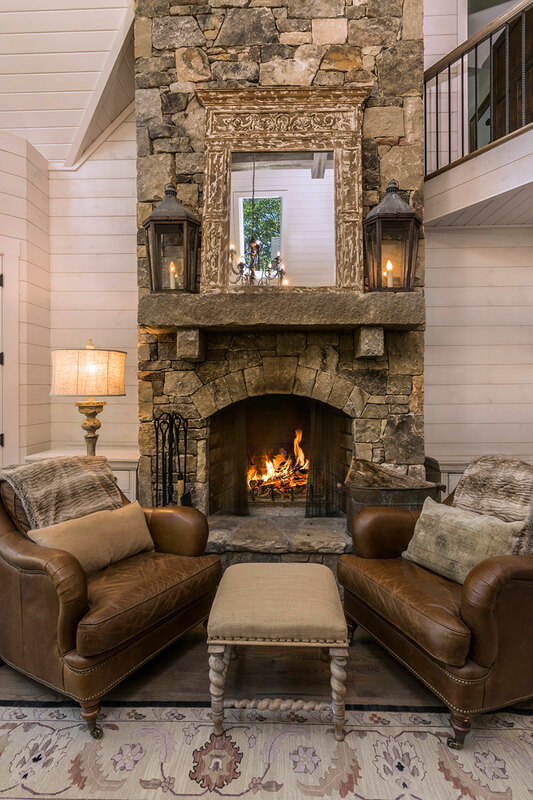 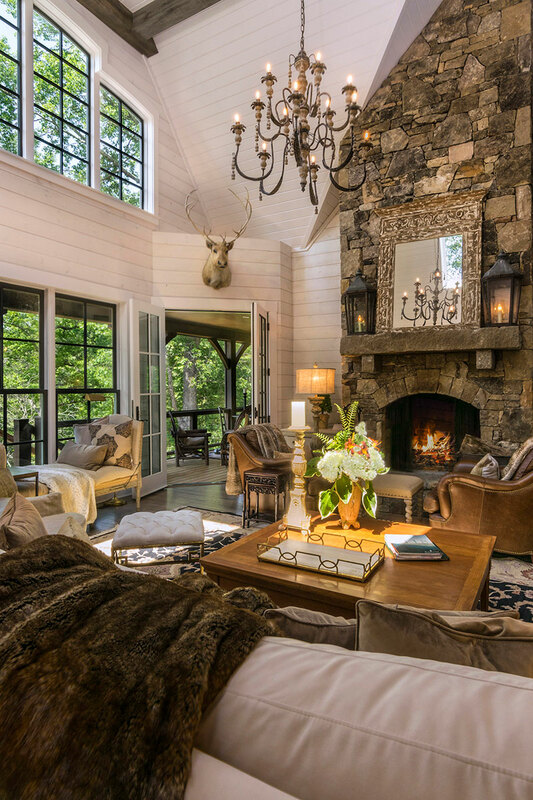 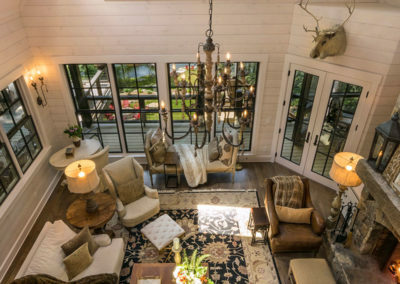 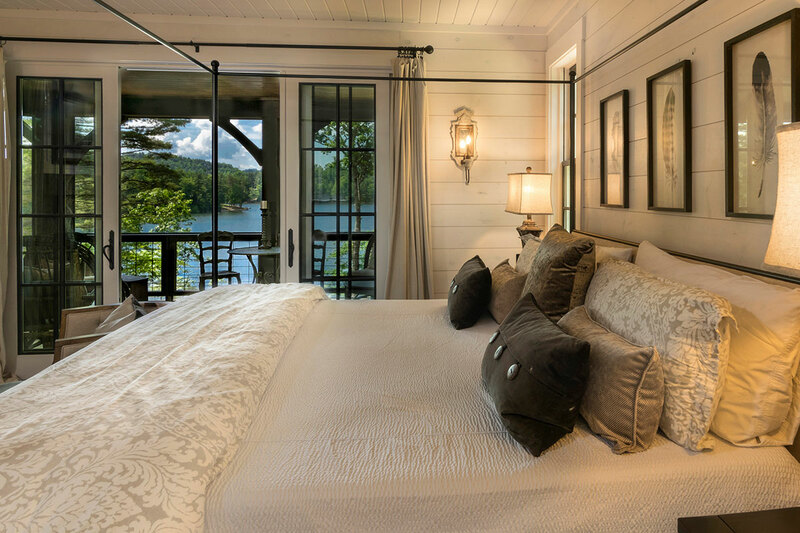 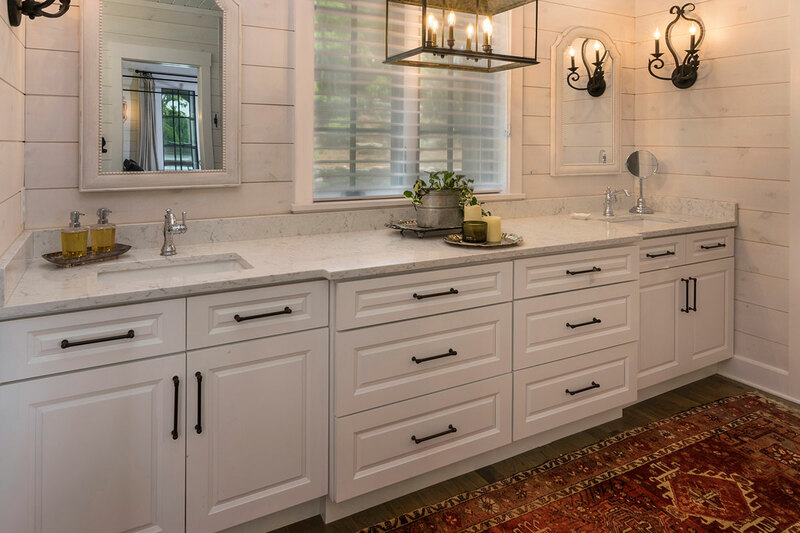 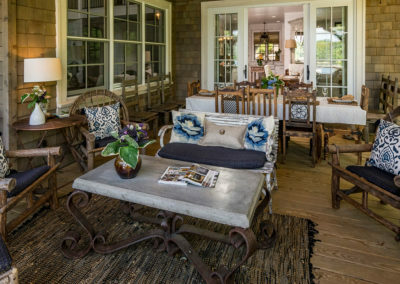 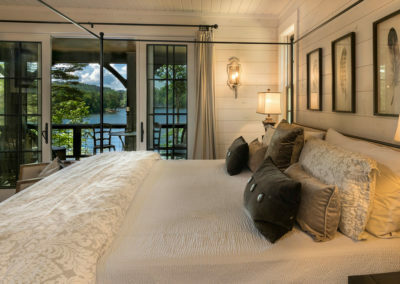 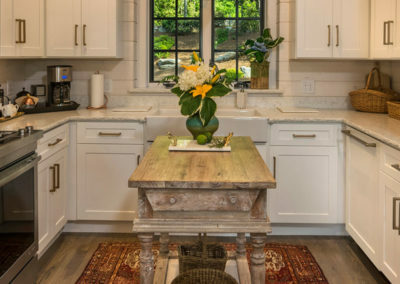 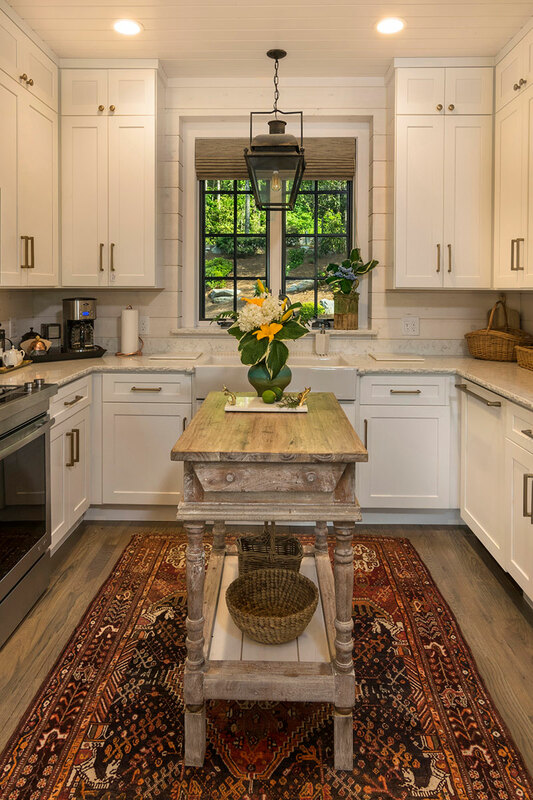 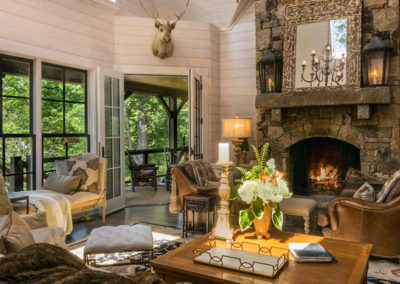 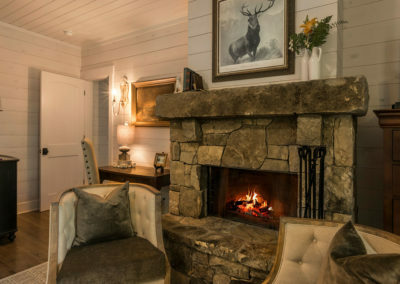 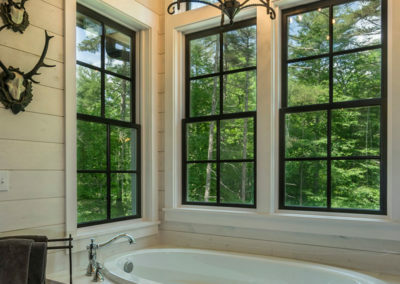 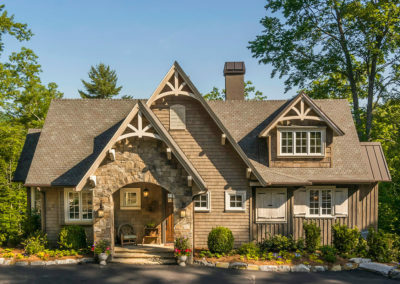 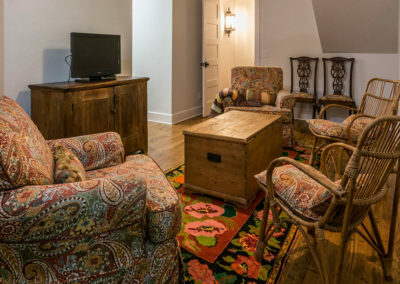 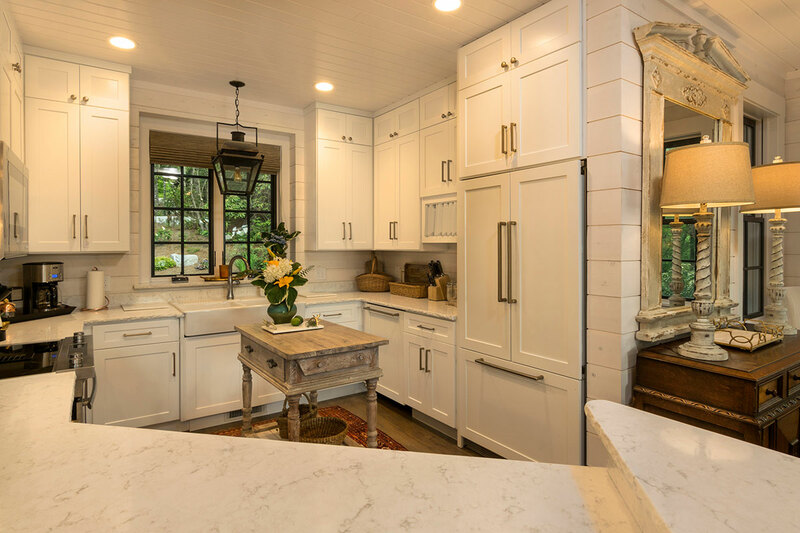 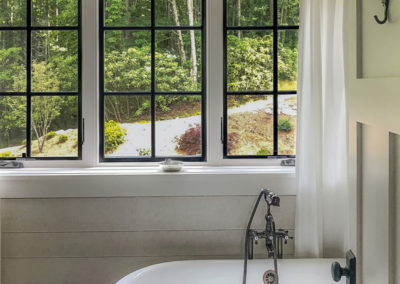 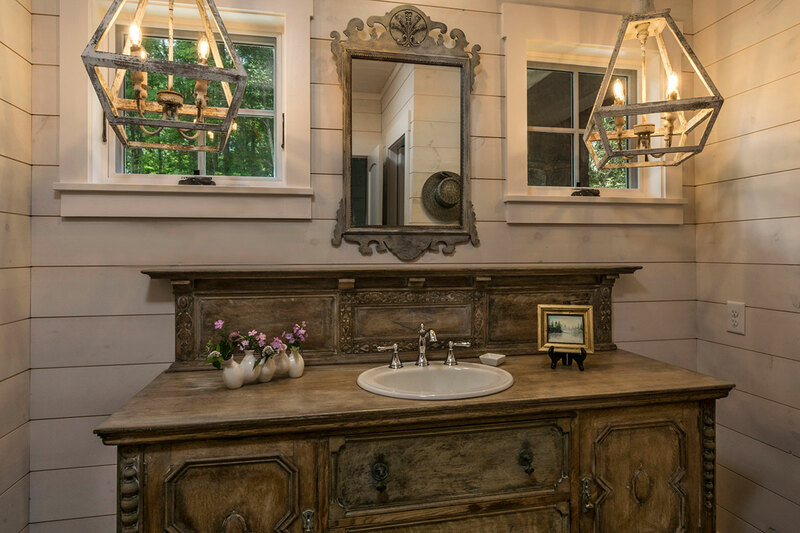 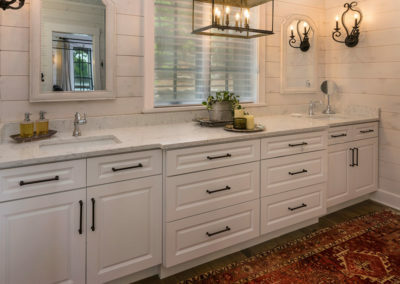 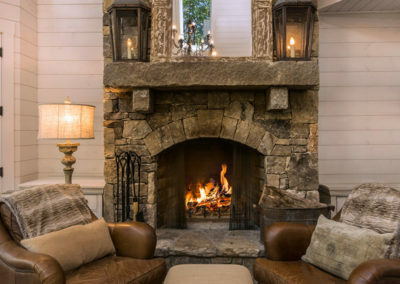 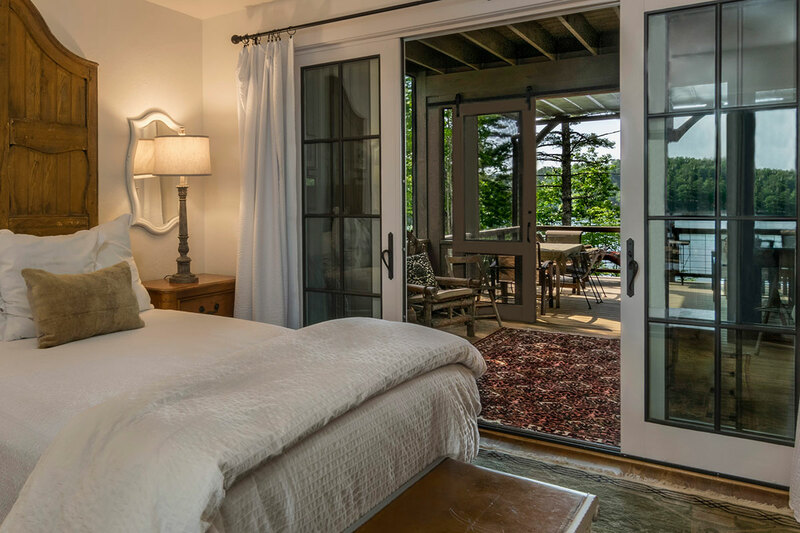 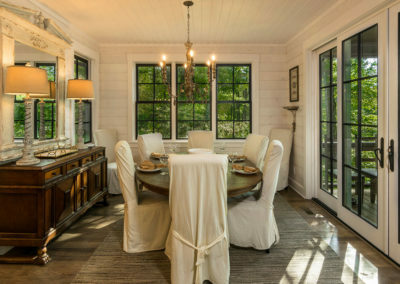 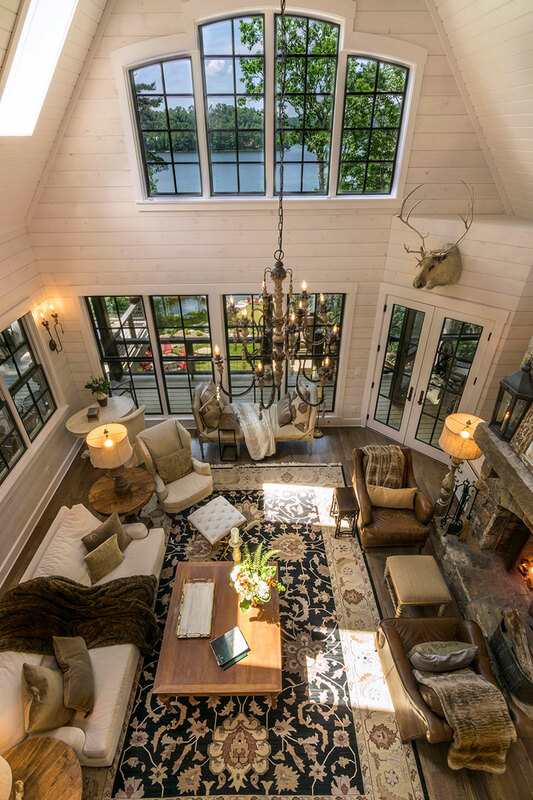 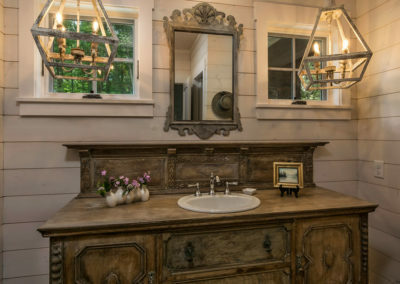 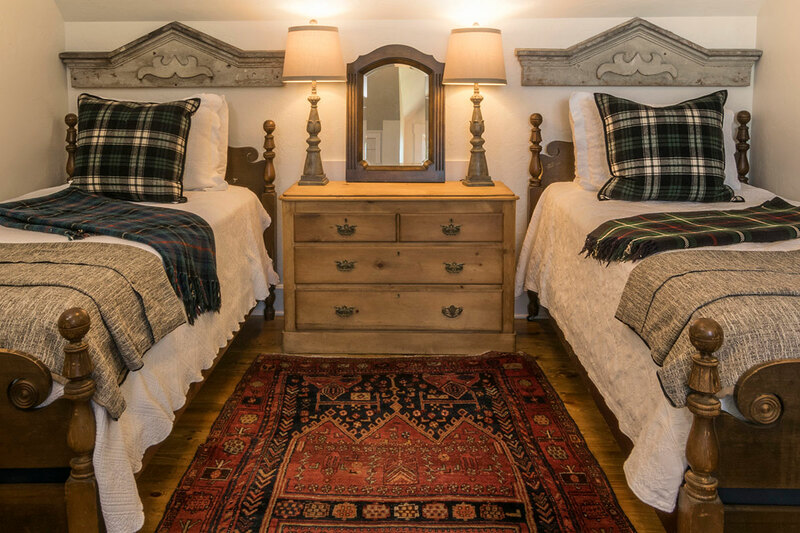 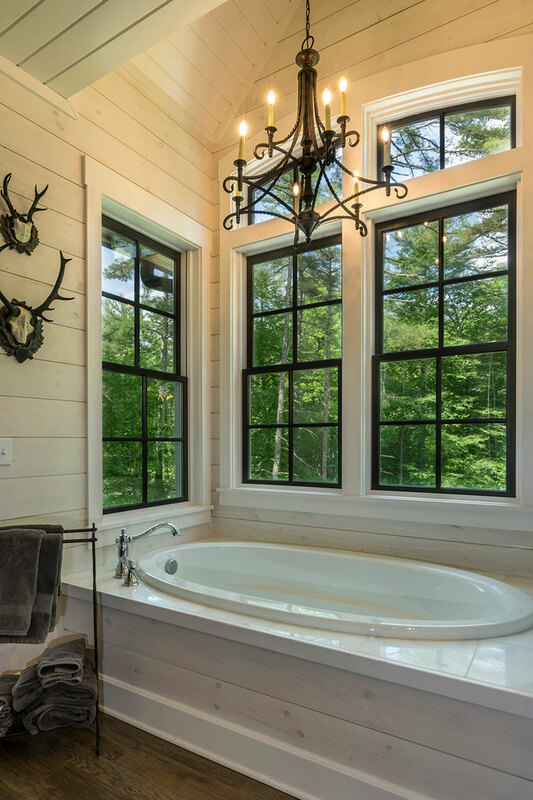 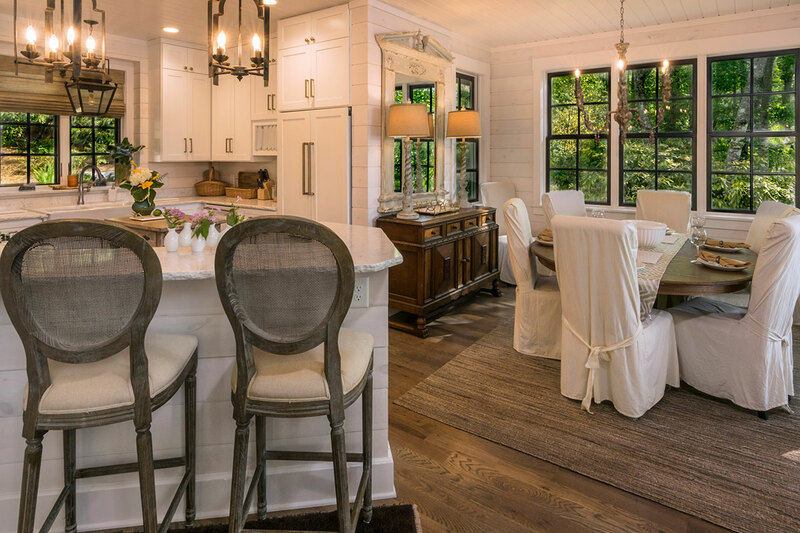 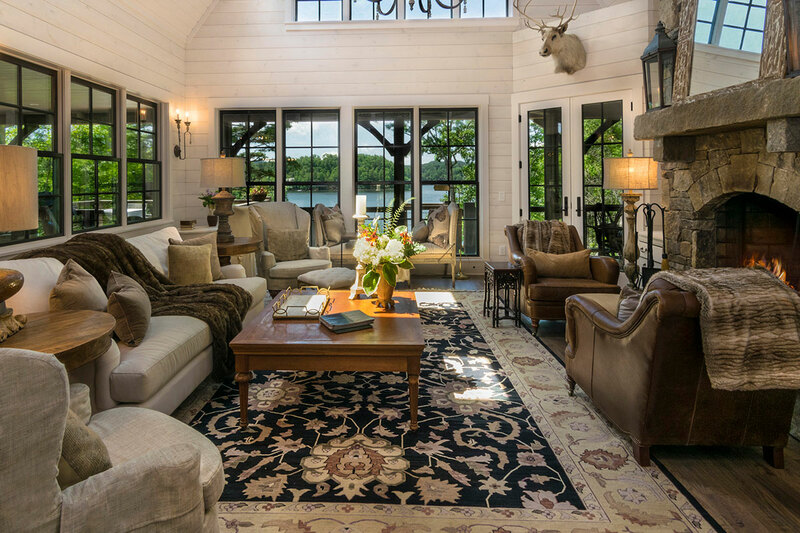 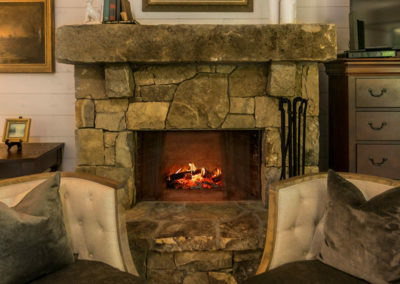 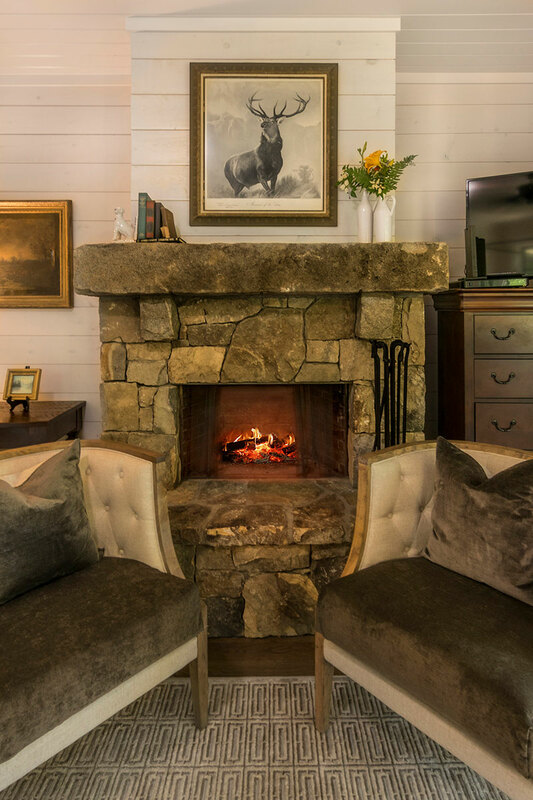 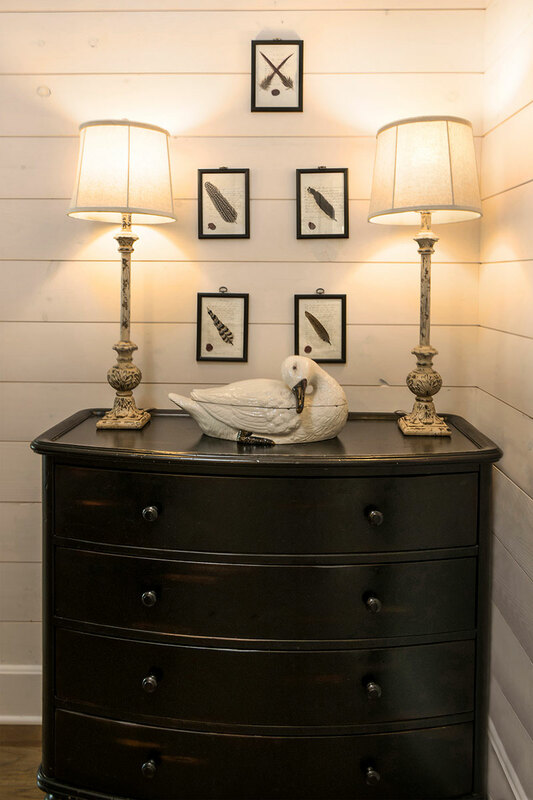 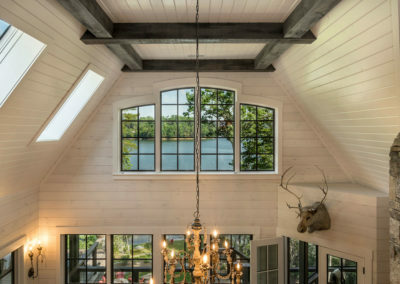 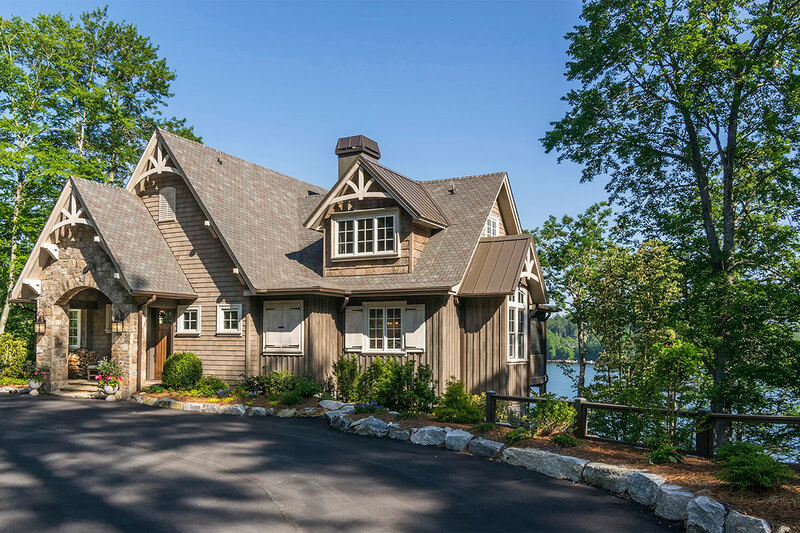 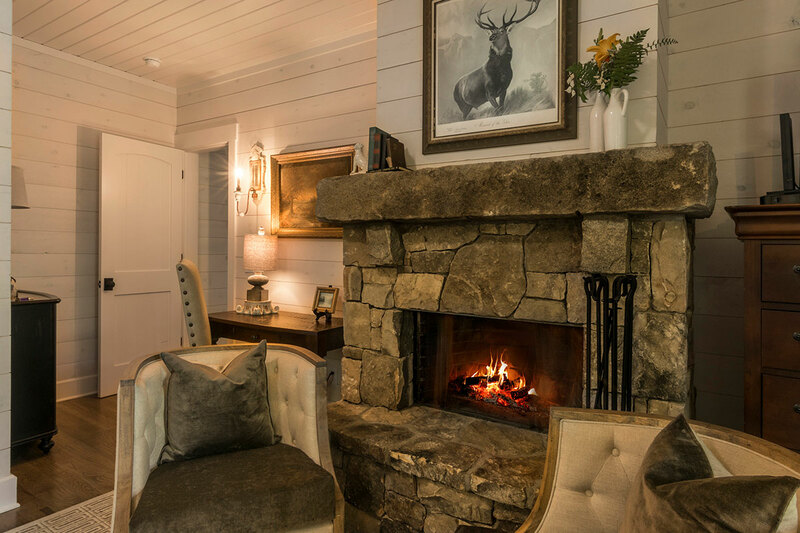 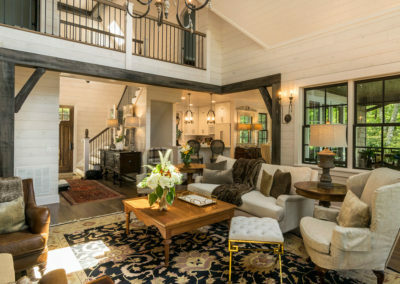 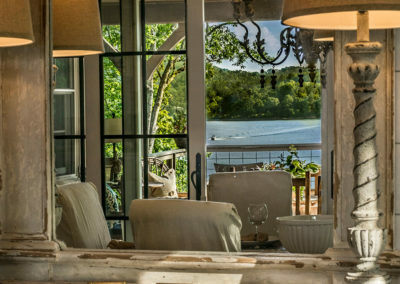 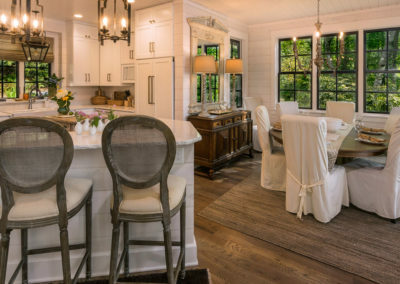 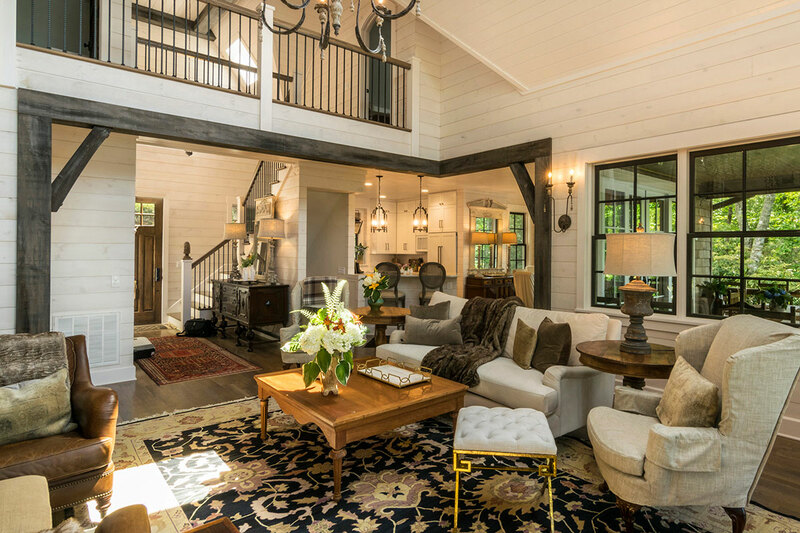 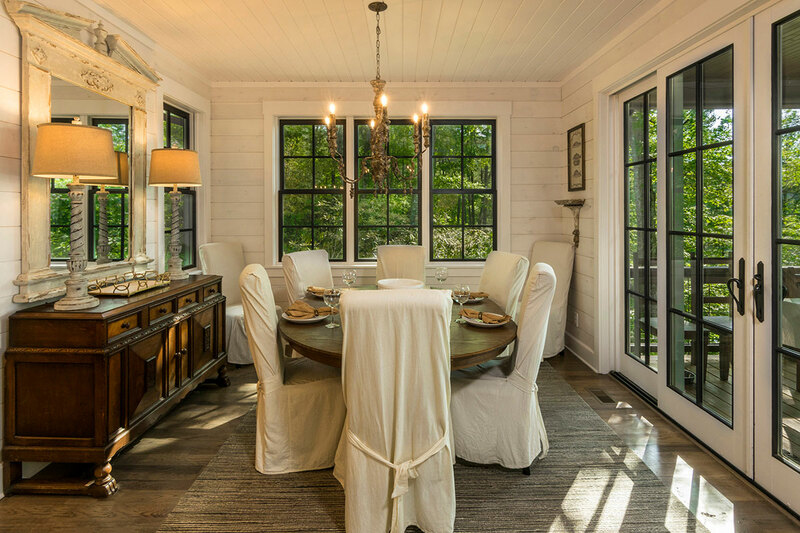 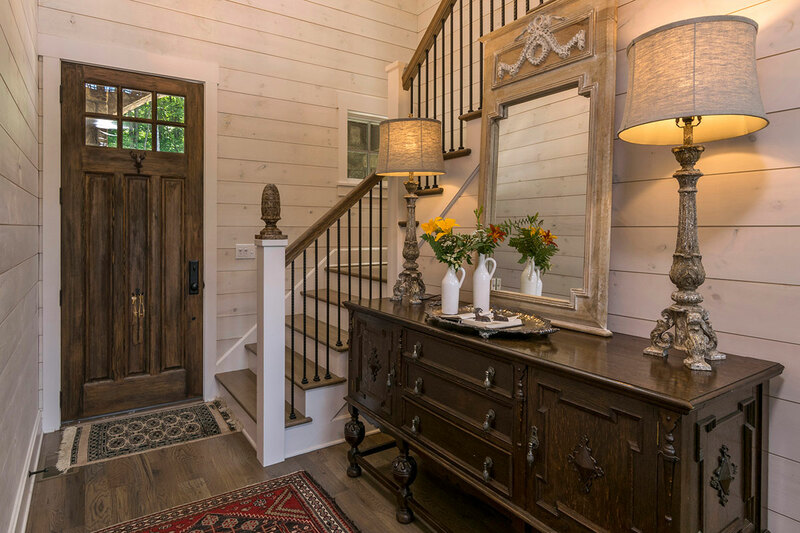 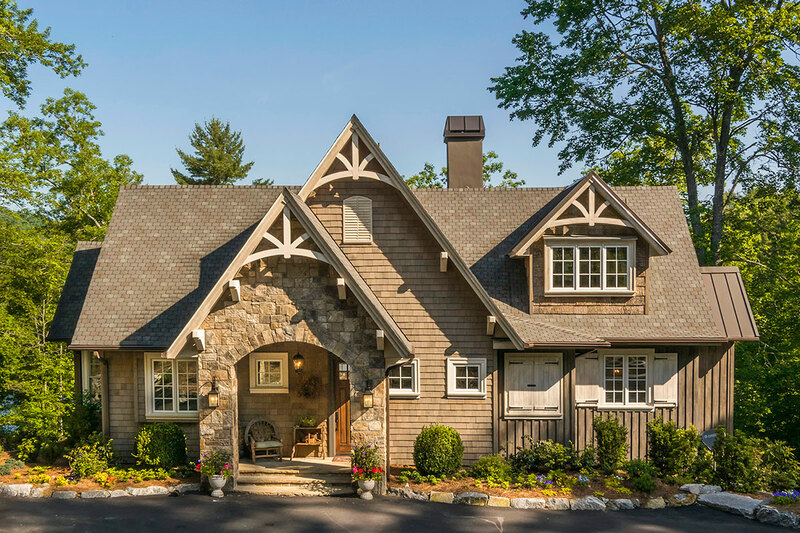 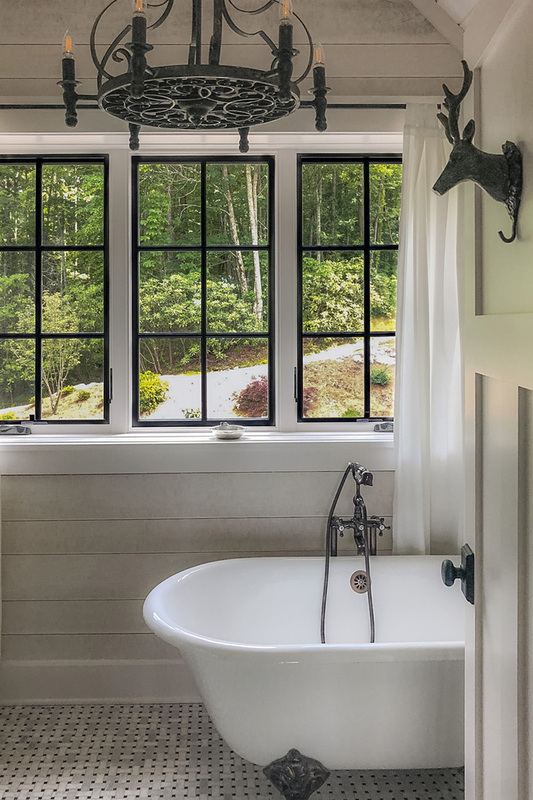 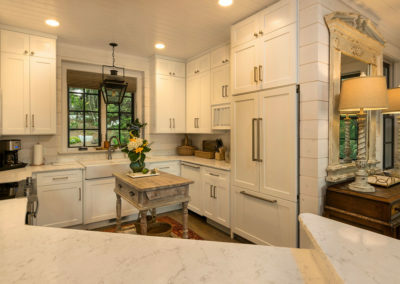 Like it’s sister cottages, Deer Run Cottage was designed to provide perfect and romantic comfort for two, yet space for a crowd. 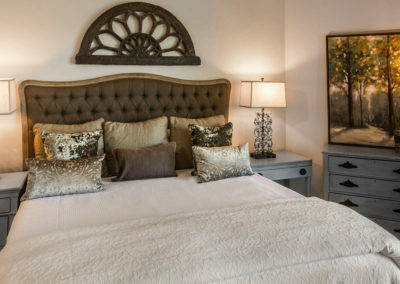 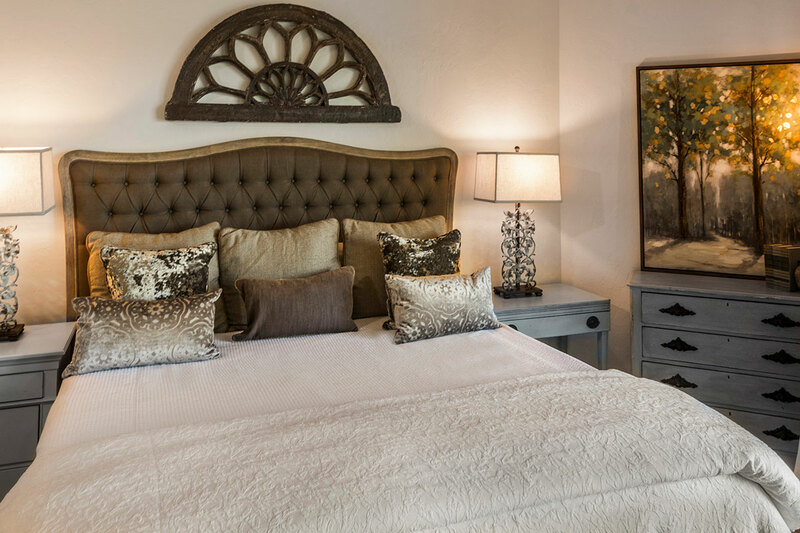 The main level offers an amazing living, cooking and dining area with stunning views and an awesome master suite. 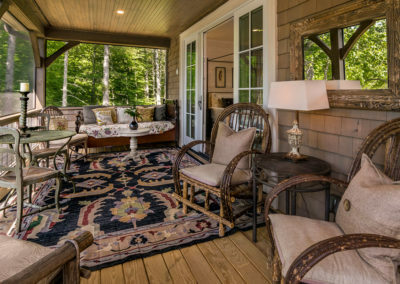 The porches on this level are where guests spend most of their time. 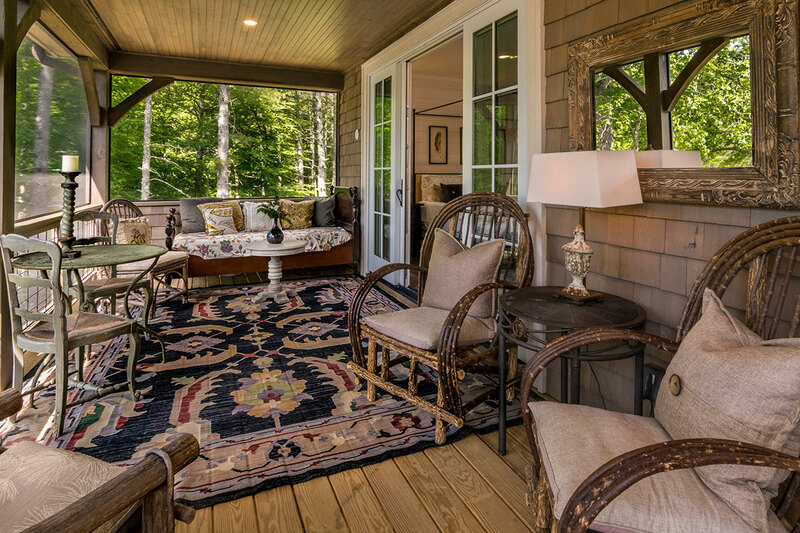 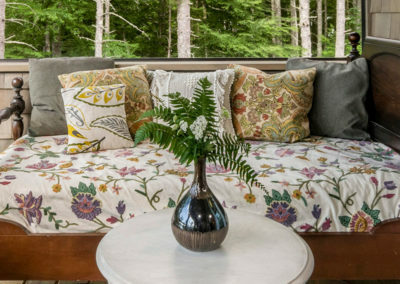 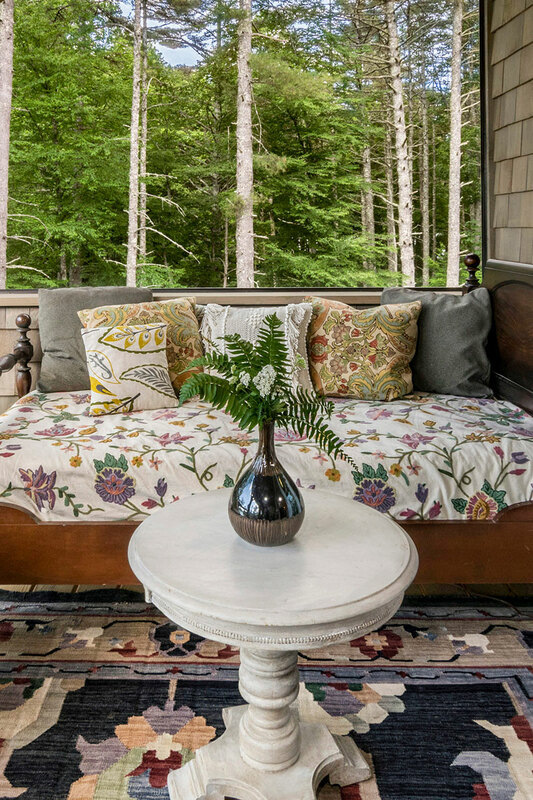 The covered porch has dining and living space; an open deck offers space for sunning and an inviting screen porch offers space for reading and napping. 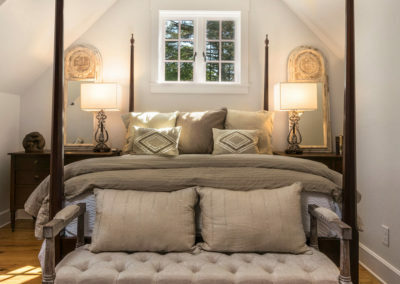 The upper level has two lovely bedrooms. 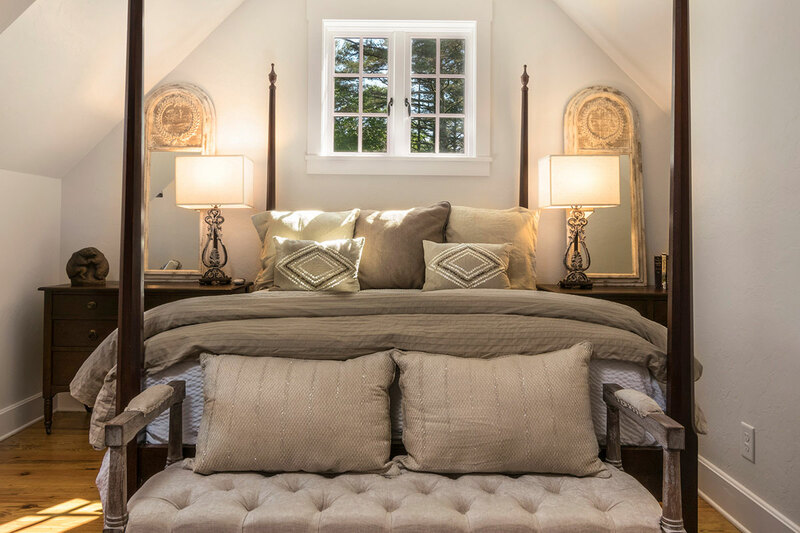 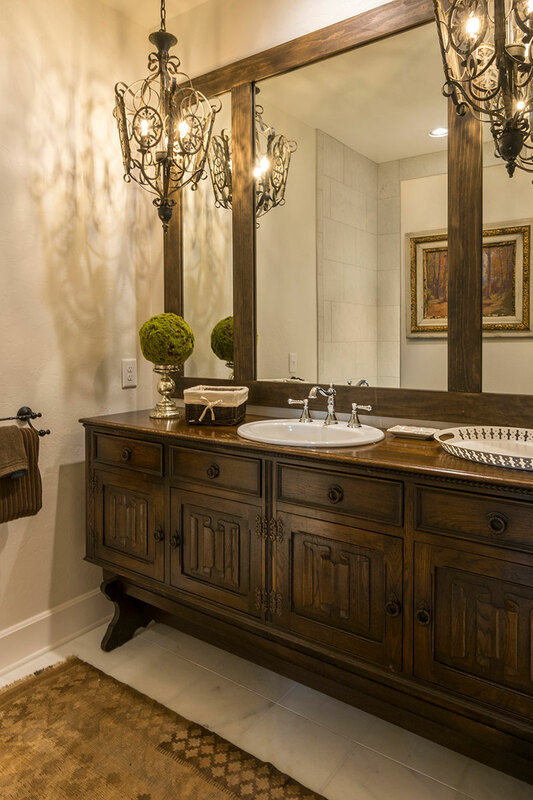 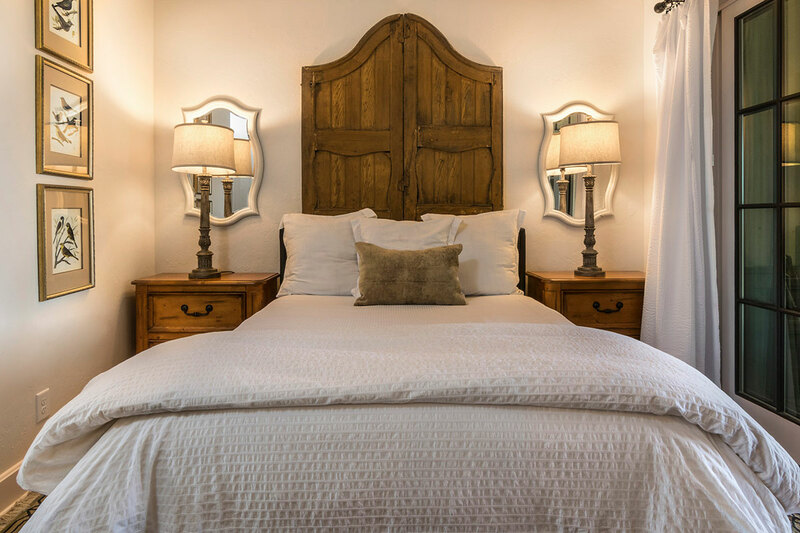 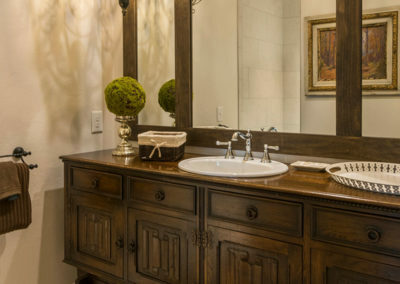 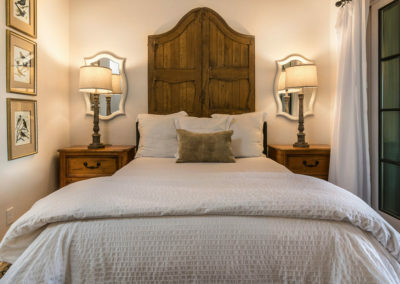 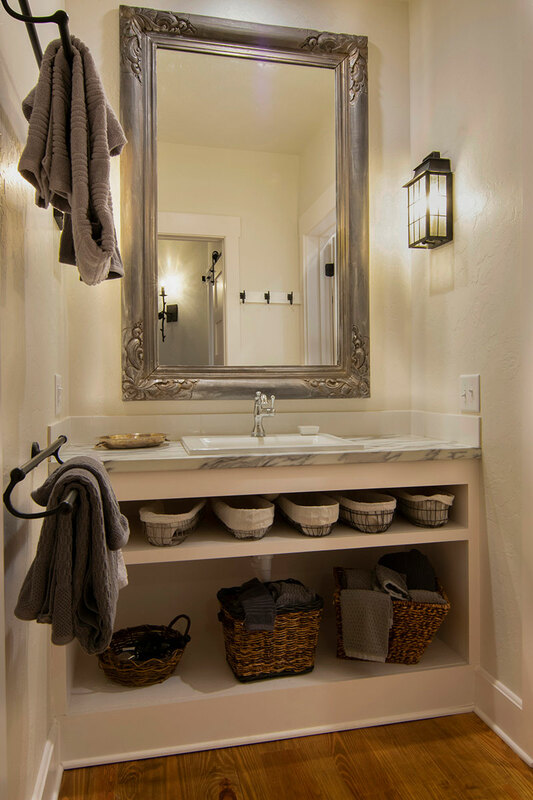 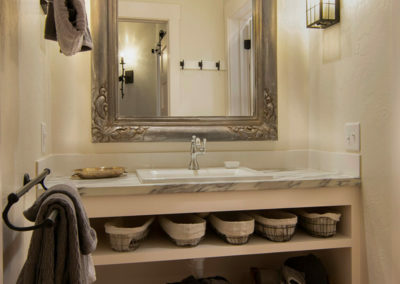 One larger bedroom with a queen size bed and a private bath featuring a claw-foot soaking tub. 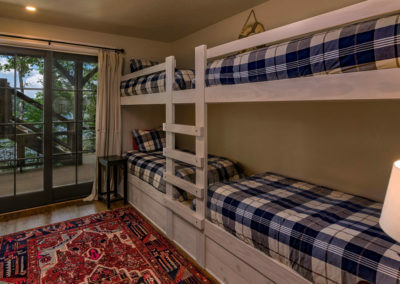 The other bedroom has two twin beds, a small window bed and its own bath. 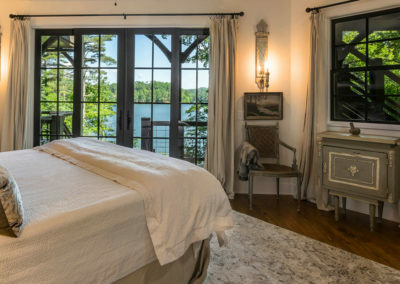 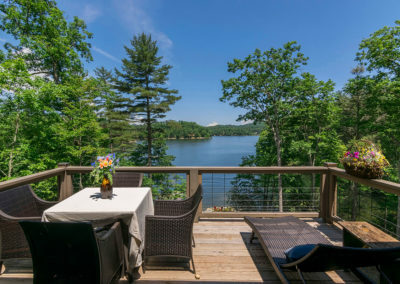 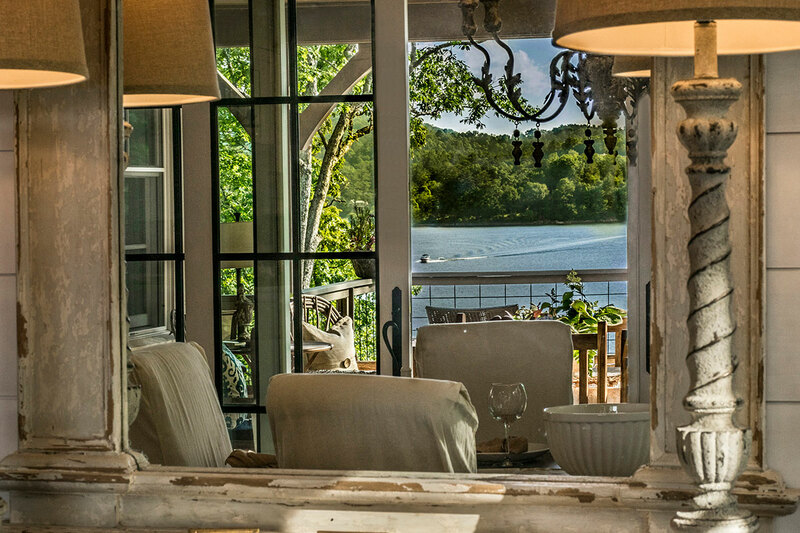 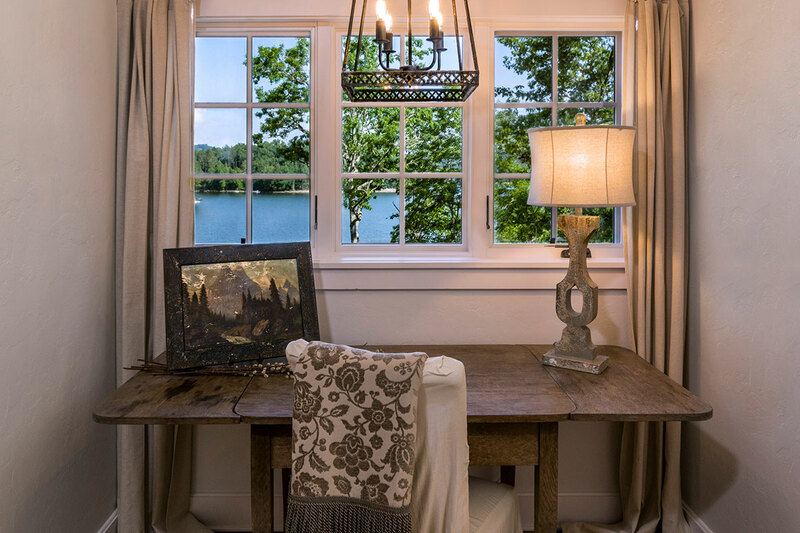 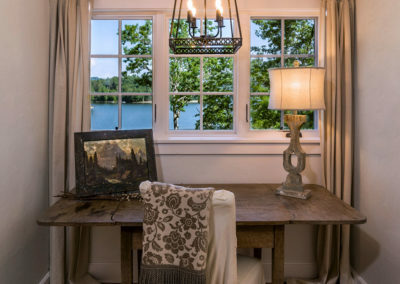 Both, of course, have a view of the lake. 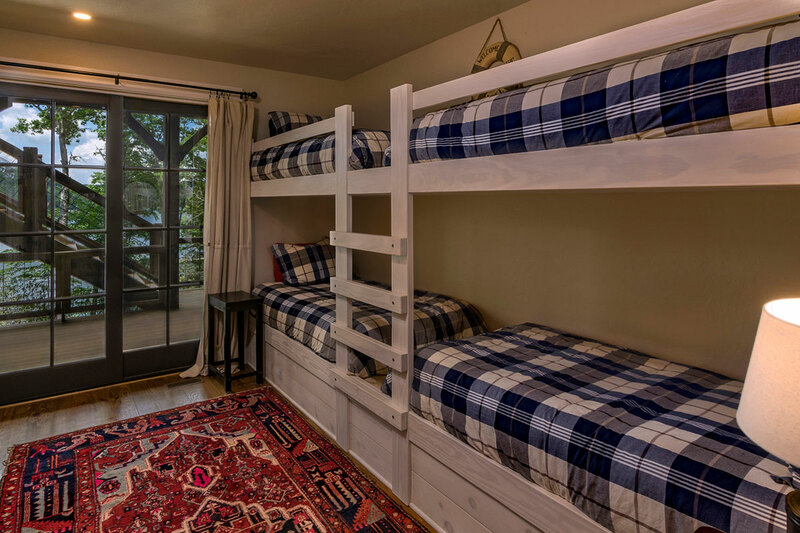 The lower level has two great bedrooms for couples and a bunk room that is perfect for children. 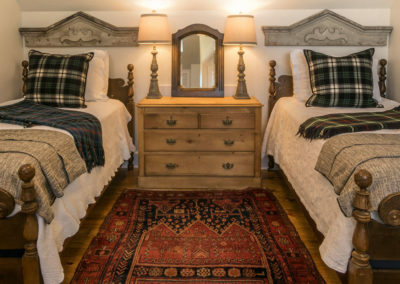 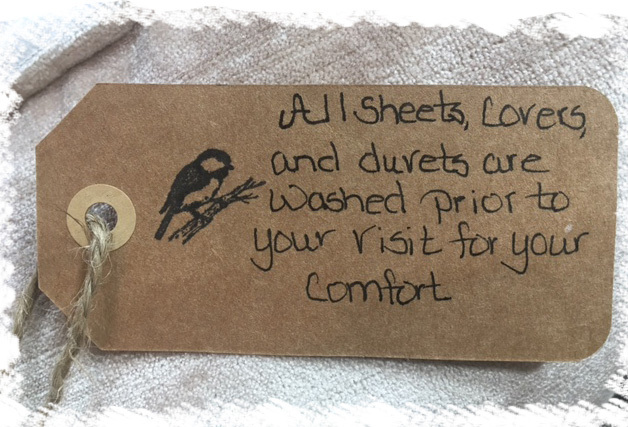 The king has a private bath and the queen shares a bath with the bunk room. 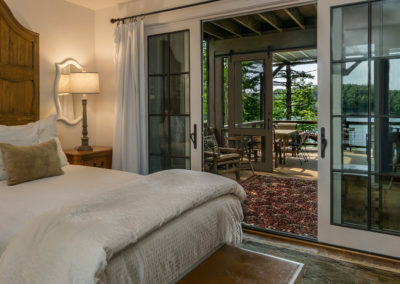 All bedrooms have doors leading out to the lower porch. 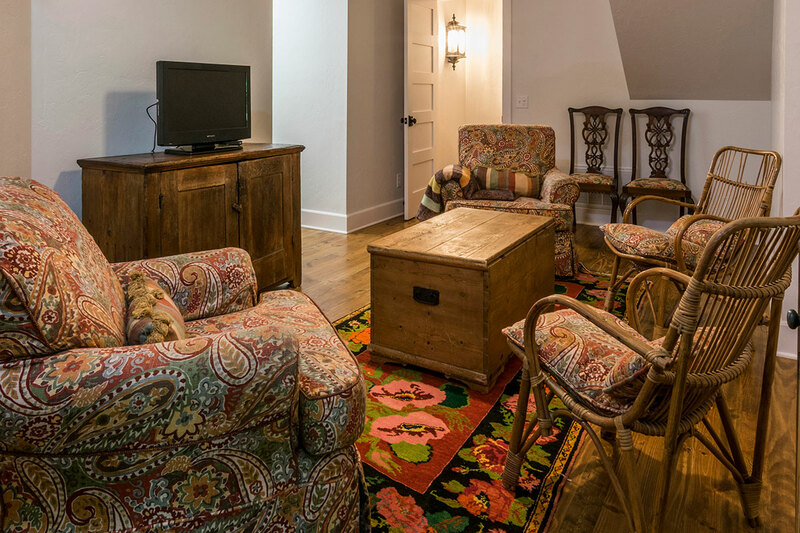 There is a TV room for children, a laundry room and an extra refrigerator.